RETAIL/CUSTOMER SERVICE offers students the opportunity to participate in the operations of actual off-site retail stores and a school store. 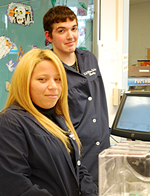 Students order items, stock shelves, develop displays and market products to the public and school population. All aspects of customer service, inventory, loss prevention, profit and loss management are included in the curriculum. business as well as its location.